the iPad & iPhone Thanks to Wanderful Books! On Friday I was looking pensively at my boxed sets of the Living Books CD-ROM collection in my school library. 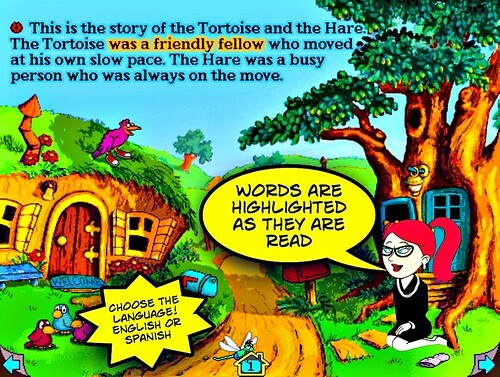 I have resisted for YEARS (ok, like 10+) to weed them knowing how AMAZING & special these interactive stories can be for ESOL or special ed kiddos but alas - the sad weeding day has finally come. Year after year when weeding time came around my sainted and patient assistant Robin Black (this is our 21st year together!) would take them off the shelf & and add them to the weeding book cart. I then would go behind her with a furtive grin & and put them back on the shelf. But this year I tested them and they do NOT work on ANY of my computers. Not any of our iBooks, MacBook Pros, eMacs (2003), or brand spanking new iMacs. We run an OSX school & these old CD-ROM's only run on classic. Noooooo! So, sniffing a bit with nostalgic ennui, I Googled them and EUREKA! 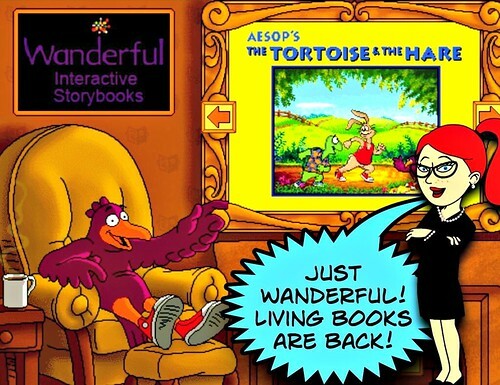 I found a recent TUAW article about how these classic CD-Rom books have now been made into iPad Apps! Woohoo! I am so glad though that that kind of creativity and artistry has come back to the consumer...the student, and the school library! When I first started teaching with these CD's in elementary school they were a wonderment! I would ask the kids to gather around the APPLE LC III and we would listen and watch each page - then using their best sentences they were to describe what they wanted me to click on to see if there was a hidden interactive pop up there! 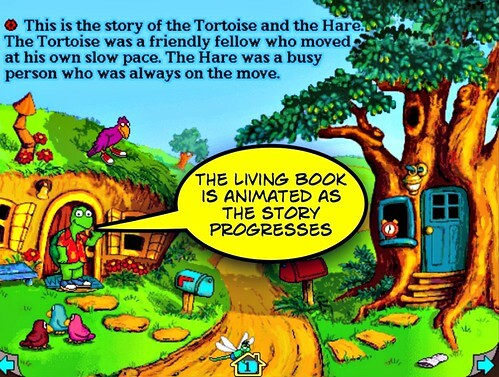 For example, "Please click on the hare's blue tree house door"
I gave out "smarties" for the best sentences and if they found one I didn't know about (there are like a gajillion!) We also did extended activities with vocabulary or even writing letters such as: "Dear Broderbund, for your next book please include...(insert creative interaction animation idea here)....with sometimes a kid drawing! Right away, I was really tempted to spend $4.99 of my own $ to try it out before I recommended it on this blog or to my colleagues...but guess what? There's a FREE Sampler! I wondered if it would just be a washed out version of the classic? No! I also wondered if all the cute hidden animations (remember the Tortoise toilet flushing when touching that blue tree house door? That always got a giggle!) will they still be there? I am so happy to report a resounding YES! 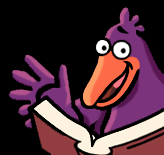 Oh and Wanderful Books? You can quote me! 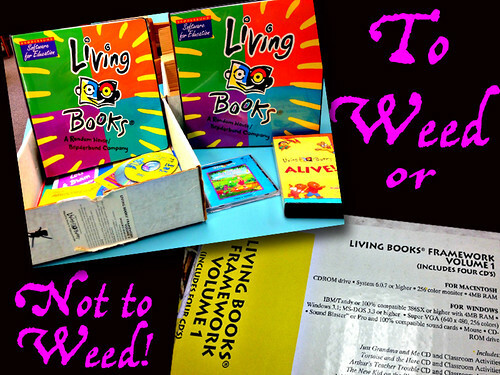 "Living books are back and they're better than ever! Engaging stories, fun interactive animations, enriching activities, and classroom activities featuring the Common Core state standards are at your fingertip with this amazing app for the iPhone and iPad!" Follow @WanderfulBooks on Twitter! I am! Check out the video below to see Wanderful Books experience! Now....what about HyperStudio & Hollywood High!?? 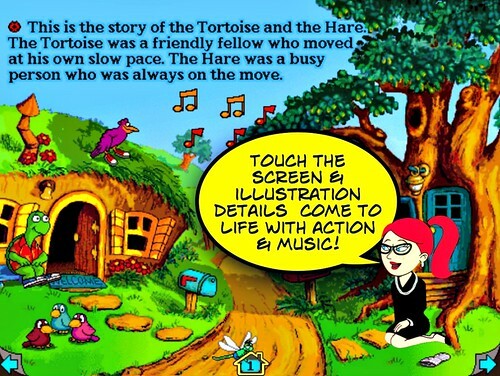 What are your favourite storybook apps? What nostalgic software would you like to see come back? As always, I adore your comments! Thank you SO much @miketrose for reporting about the APP! 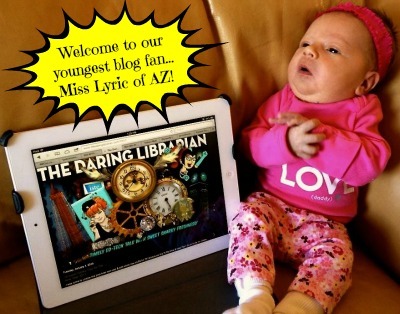 A huge warm welcome to our newest and youngest blog fan....Miss Lyric of AZ! (Critter Sharpes' human sis!) My dear GCT friend Ms. Mensing's latest pride & joy! HAH! I still have a plastic tote with Living Books stored in my basement - just couldn't toss them out! Since my elementary librarians don't have an iPad, I went looking in the FAQ's for other platform options. Future plans: "We will introduce Android, Mac OS and Windows versions later this year. Stay tuned." Good news for readers everywhere. Thanks dear Linda for your comment! I saw that, too! Thanks for adding that important future feature! So, what good are those tote CD's without a platform to play them on? Just educational nostalgic hoarding, like me? LOL We don't have iPads either (well, our Spec Ed dept. has 1) but I'm hoping to get some soon! Wanderful sounds wonderful! I can't wait to use this app with my students and your newest blog follower...who happens to be the cutest baby ever! Also loved your mention of the old school Apple. I had a coveted Apple IIC back in the day and I worshipped that thing! I think our newest blog follower will LOVE these books! Sooner than you know she'll be workin that iPad! #AppleGrrls4Evah! This is fabulous news! Our children grew up on living books and we just couldn't part with the CD's even though we no longer having anything that plays them. We are now ready for the next generation to come along and share the joy! They are perfect for the iPad. And now Wanderful books are available for Mac laptops and desktops too! Perfect for library access.